Well, today turned out to be a gorgeous day with just a couple showers. No thunderstorms or hail, thank goodness! In this post I’m just going to follow up on the St-John’s-wort dyebath, and show some photos of my set-up in the pavilion at the Cummington Fairgrounds. First, here are some of the samples I brought to show. In the basket on the left are yarns that are dyed with plants you have to grow or purchase, and which don’t grow wild around here. These include madder, orange cosmos, weld, purple basil, Lady’s bedstraw, and marigolds. 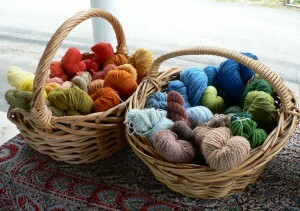 In the basket on the right are yarns that are dyed with a woad vat to make blue or green (woad-blue on top of yarns previously dyed yellow). The pinkish colors are from exhausted woad leaves, second year leaves, and my sole attempt at a urine vat. 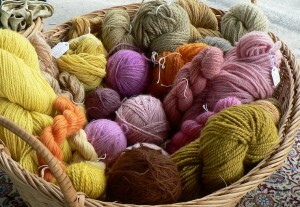 Below is a basket full of colors that can be obtained from wild plants and umbilicate lichen. Wild plants represented here include yarrow, Queen Anne’s lace, goldenrod, tansy, wild mustard, yellow sorrel, sheep’s sorrel, black walnut, St-John’s-wort flowers, poke berries, purple loosestrife, and northern bedstraw. All the pinks are from umbilicate lichen vats. This weekend, May 24th and 25th, is the 40th annual Massachusetts Sheep and Woolcraft Fair at the Cummington Fairgrounds. I am doing natural dyeing demonstrations again this year. I was there from 2-4 yesterday and will be there from 1-3 today. Yesterday’s weather was lovely for most of the day and I had a large crowd. Thanks to everyone who stopped by to watch and listen and ask questions! We had a brief heavy afternoon rainstorm but it cleared up after about half an hour. Today is supposed to be warmer with a slight chance of heavy rain and hail. Well, let’s hope for the best. To prepare for the demo, on Friday night I made a dyebath with 12 ounces of dried whole tops of St.-John’s-wort from last fall. I cut the tops back after the flowers had gone by, and the dried stems and leaves had turned an amazing red color. I’ve used St.-John’s-wort flowers before, and the whole tops in bloom, but never just the dried tops alone. So, it is an experiment. 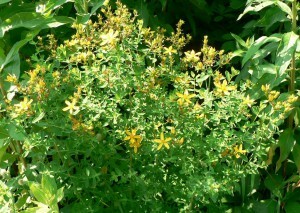 Here’s what St.-John’s-wort looks like in bloom.